There are many types and combinations of types. We truly custom make Permanent plans for individuals, businesses, couples and trusts. These are Whole Life and Universal Life contracts. Term Insurance is offered with premiums fixed for desired lengths of time from one year to any longer period. Final Expenses Life is a small face amount policy with limited underwriting. 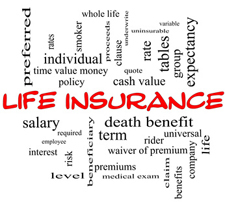 Guaranteed Issue Life has no underwriting but there are some restrictions. Disability Insurance is designed to replace lost wages and lost cost of living should a partial or total disability occur. Young professionals are taught to buy this but many other people don't know about it and rely on employer sponsored coverage. We urge every working person to have his/her own policy. We can program around group disability. People are living longer and neither health insurance, nor Medicare, will pay the costs for in home, in facility or in hospice medical care. We have Long Term Care policies available for every budget. These include conventional Long Term Care, Partnership Long Term Care and Hybrid Long Term Care. A Hybrid is a policy that does at least two things-- provides a death benefit, a Long Term Care benefit or both. These contracts are promises for tax deferred growth for retirement with any number of payout scenarios-- for life, for a specific number of years or for a specific amount or monthly benefit. Some annuitants choose interest withdraws leaving principal intact. Annuities are custom made contracts and we'll be glad to discuss them. Our protege, Pam Cousert, is an expert and she is in house with us and we refer all inquiries to her. These days call for a specialist in all matters involving health insurance.